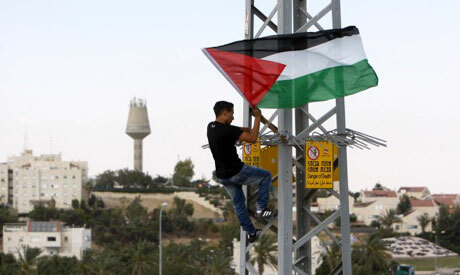 A Palestinian protester places a Palestinian flag on an electricity pylon during a protest at the entrance to the West Bank Jewish settlement of Maale Adumim near Jerusalem, to show solidarity with Palestinian prisoners held in Israeli jails, Sunday, (Photo: Reuters). Palestinian prisoners on hunger strike have agreed a deal with Israel to end their fast in exchange for an easing of their conditions, Palestinian and Israeli officials said on Monday. "All of the factions signed an agreement to end the strike," Qadura Fares, head of the Palestinian Prisoners Club told AFP after several hours of negotiations between prison officials and the senior detainees at Ashkelon jail. Israel Prisons Service spokeswoman Sivan Weizman confirmed an agreement had been reached, but said it applied to "the security prisoners who have been on strike for 28 days." The agreement, she said, was reached "following understandings formulated in recent days." Most of the 1,550 prisoners on hunger strike have been fasting for up to 28 days to demand an improvement in their conditions, but another seven prisoners have been refusing food for between 53 and 76 days. It was not immediately clear how the agreement would relate to the smaller group, most of whom stopped eating in protest against their being held without charge in administrative detention, a procedure under which suspects can be held without charge indefinitely. News of the agreement was also confirmed by Gaza's Hamas rulers. "Hamas confirms signing of the deal to end the hunger strike. It was confirmed by the Egyptian ambassador who supervised the negotiations," a Hamas statement said. Fares told AFP the negotiations had stuck over several points until a senior Egyptian military officer had arrived at the prison to mediate. "The main differences were over solitary confinement, visits from Gaza and administrative detention, so an Egyptian officer came and participated in the negotiations," Fares told AFP.